The most serious obstacle impeding the capture of San Pietro was Mt. Sammucro, 4,000-foot Hill 1205. This mountain, one of the steepest heights scaled by Allied troops during the war, descends to the village of San Pietro on its southern slope. Along its icy trails and treacherous cliffs the Germans had craftily organized a formidable chain of mutually supporting pillboxes. THROUGH VENAFRO ran one of the most heavily used supply roads of the campaign for Southern Italy. 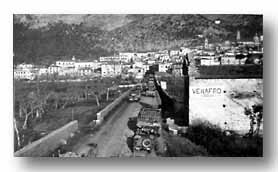 Troops coming out of reserve would invariably comment, "No matter how often we go back into the line, we always start from Venafro." For the December 8 San Pietro assault, Colonel William Martin ordered the 1st Battalion, 143rd Infantry, to attack the summit of 1205. 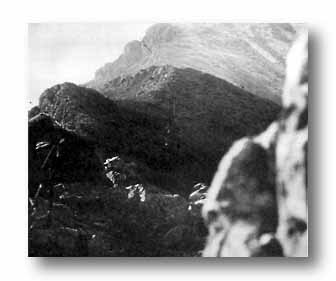 Upon achieving its objective, it was to attack along the ridge to a point northwest of San Pietro. The 3rd Ranger Battalion was to seize Hill 950, another feature of the Sammucro hill mass. The 2nd Battalion, 143rd, was to drive over the olive orchards northeast of San Pietro. The 3rd Battalion, in support, was to follow the 2nd at a distance of 400 yards. As night fell our artillery hammered powerfully at the enemy's main line of resistance. It was raining at H-Hour when the 2nd and 3rd Battalions crossed the line of departure. Some 200 yards forward they encountered mines and automatic fire from the German pillboxes. German mortar and artillery fire were deadly by reason of excellent observation from enemy-held Mt. Lungo, overlooking our advance. The 3rd Battalion was committed. But the advance never gained more than 600 yards. Our initial assault on San Pietro had been repulsed with heavy casualties. On 1205, however, the 1st Battalion attack succeeded brilliantly. 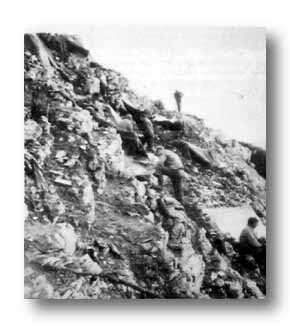 The 1st battalion, commanded by Lt. Col. William W. Burgess, began an exhausting five-hour climb up rugged Mt. Sammucro at 1500. Under cover of darkness the men crawled up the slopes, sometimes on all fours, sometimes chinning themselves over the sharp rocks that cut into their shoes, sometimes using their ropes as lassoes to pull themselves over the otherwise impassable cliffs. Doing without overcoats and blankets, they still perspired freely on a night that neared the zero mark -- it was work to climb that mountain. When the Germans sensed approach to the summit they rolled man-sized boulders over the top. Occasionally our own men, struggling to keep going, slipped on the ice and loosened other rocks. These boulders, gaining momentum in their descent, caused as many as a dozen casualties on one downward journey. THE BARREN SUMMIT of Mt. Sammucro is pictured from a point halfway up the mountain. But Lt. Rufus Cleghorn's A Company gained the summit before the strongly entrenched entrenched enemy fully realized that an assault was upon them. The infantrymen, summoning every last measure of their strength, stealthily crept up to each successive pill-box and neutralized it until the Germans withdrew stunned. To the right the 3rd Ranger Battalion also had captured its objective, but only after successive attacks and costly casualties. For on Hill 950 the enemy had been alerted. Counterattacks were expected. They followed quickly, seven of them in the first day. Maj. David Frazior, who had replaced the wounded Col. Burgess, and his battalion checked the Germans as they struck back with unceasing violence. The slopes of Hill 1205 were strewn with the dead of both sides. Prisoners captured by the 1st Battalion stated that they had been ordered to retake Sammucro at all cost. Four days later the 504th Parachute Battalion reinforced the 1st of the 143rd which threw its entire remaining strength into the push along the ridge. The attack gave out one hundred yards short of the objective when severe losses in this extreme effort forced a halt. But San Pietro was soon to fall. It has been said by military men of wide experience that the physical discomforts of Washington's Army at Valley Forge could not have been compared to those suffered by the foot soldier in the Italian mountains. Hill 1205 substantiated that opinion. For ten days at an abnormal altitude the men fought on without blankets, overcoats, or raincoats. Under these conditions, freezing temperatures made sleeping dangerous. Even for those who stayed awake frozen feet was common. Then, too, for the first three days food and water were inadequate -- only a single K ration unit per man during the period and a single veedon of water for a squad. If it was difficult to bring up supply, it was also difficult to take down the wounded. To negotiate Sammucro required considerable stamina even without packs or rifles. To climb it carrying a box of rations or to come down it with a litter demanded maximum effort. Below Mt. Sammucro the 2nd and 3rd Battalions twice again attempted to break through the olive groves toward the town. Both times they met heavy German fire and were stalled. Volunteer patrols made desperate attempts to reach enemy positions and reduce the strong points but not a single member of any such patrol ever came back alive. San Pietro had not yet fallen, but the capture and securing of strategic Sammucro threatened the German position all the way to San Vittore. BOULDER-STREWN, sharply sloping mountains made even the most conscientious foxhole-diggers give up in despair. Instead, shelter halves were rigged up wheerever advantageous rock formation afforded protection from the weather and enemy artillery.